Utilizing assistive technology concepts for farmers with a limiting or disabling condition. Providing on-site assessment to help farmers & agricultural workers remain productive. 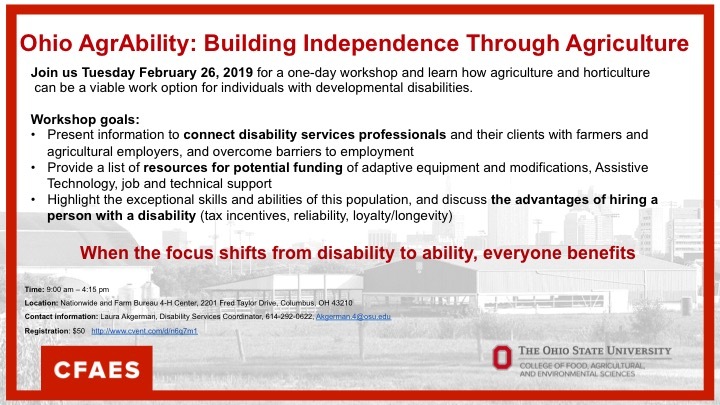 Ohio AgrAbility provides information and promotes awareness on preventing further injuries because of a disability or limitation. Our "Peer to Peer" program connects individuals who have similar experiences, to share ideas and sucesses. Promoting success in agriculture for Ohio’s farmers and farm families who are coping with a disability or long term health condition. You are invited to Columbus Ohio for a conference!